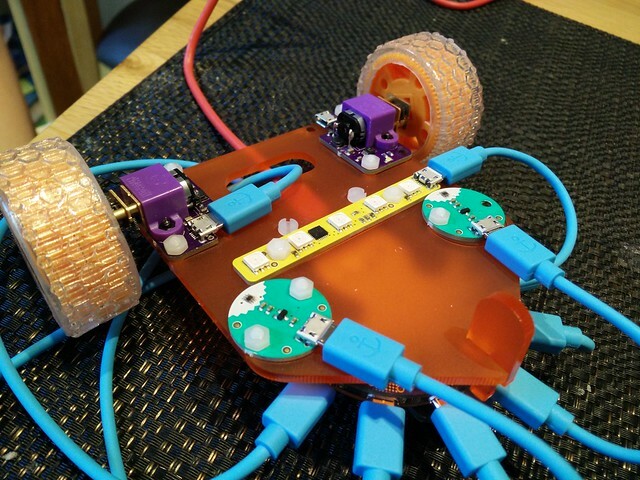 “Flotilla – Friendly Electronics for All” is the headline, which sounds pretty damn good to me, someone who is permanently afraid of blowing his Arduino and other kit by connecting something the wrong way around. So this, which has a ton of sensors and outputs, and a central dock for making them talk to each other, which all works over USB, is perfect for me. We also used a first version of the “Getting Started” booklet to see us through the initial stages. Once you’ve done those, you can watch the video for how to build your own robot which you can control over your network using all the different sensors and controllers you get. My 6yo was able to put the whole thing together himself and learn how to control it predictably in under two hours, which was brilliant! We did actually run out of the plastic screws used to hold it all together – I think someone in the warehouse was tired and we ended up with fewer than expected but just about managed to get it all together and have been assured more are on their way! I was really glad to discover that the flotilla daemon runs on a Kano, which we’ve had for a couple of years now and which my son loves, because the forums had made me a bit nervous about which OSes were supported. We’re really looking forward to the rest of the instructions arriving, but my son is already completely delighted with the fact that he has built, and can control, his own robot! I just want to know if the flotilla daemon will run from a Pi Zero powered by a power bar so we can put them on the back of the robot and cut the cord it currently needs to the regular Pi!